The basic steps of Java internationalization are simple. In this tutorial, we'll provide a starting point for the internationalization features of the Java programming language. When developing software or websites today, an essential consideration is the global marketplace. As the growth of software products for global markets continue, it has become critical for companies to design products that interact with users in their native regions and languages. Software developers working on software for foreign markets should be aware of each market’s customs and differences. Some of these differences can include language, punctuation, currency, dates, times, numbers, and time zones. If the software will be used in international markets, the initial software design should include planning for the international requirements, such as the target market, language and the level of the internationalization effort required. 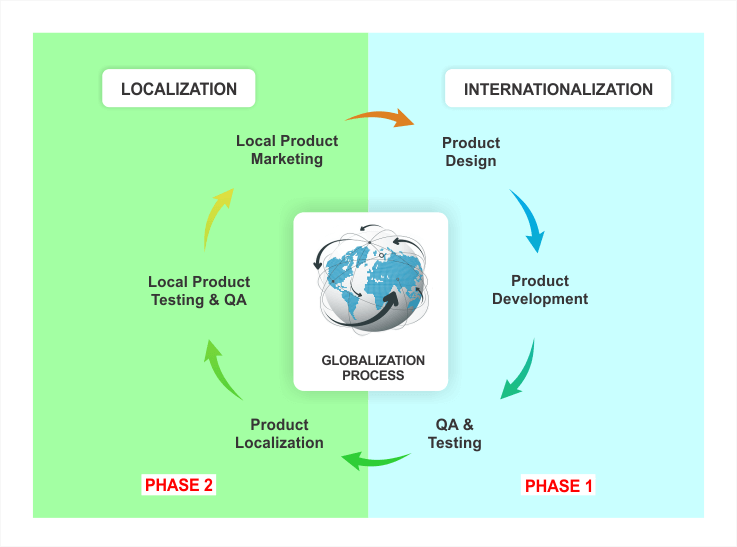 Figure 1 shows a typical internationalization and localization process during the standard software design, development, and testing process. Figure 1. Internationalization and Localization Process During Software Development. Creating a localized version of a software can become problematic and unwieldly when changes need to be implemented across multiple versions. The alternative to customizing software for each region is called internationalization. Internationalization is also known as I18N, because there are 18 letters between the first “i” and the last “n.” I18N is used to define a set of source code and binary used to support all of the markets that will be sold. An example of a software that uses internationalization is Microsoft Office. Microsoft Office 97 was shipped as separate binaries, however, MS 2000 has one source code with language packs available as an add-on. An executable can run in a global market with the addition of localized data. Elements that are specific to a local market are stored outside the source code and retrieved dynamically. Culturally-dependent data appear in formats that conform to the end user’s region and language. The designers of Java realized early that internationalization of Java would be an important feature of the language. Java currently supports 100 locales, depending on the Java version. 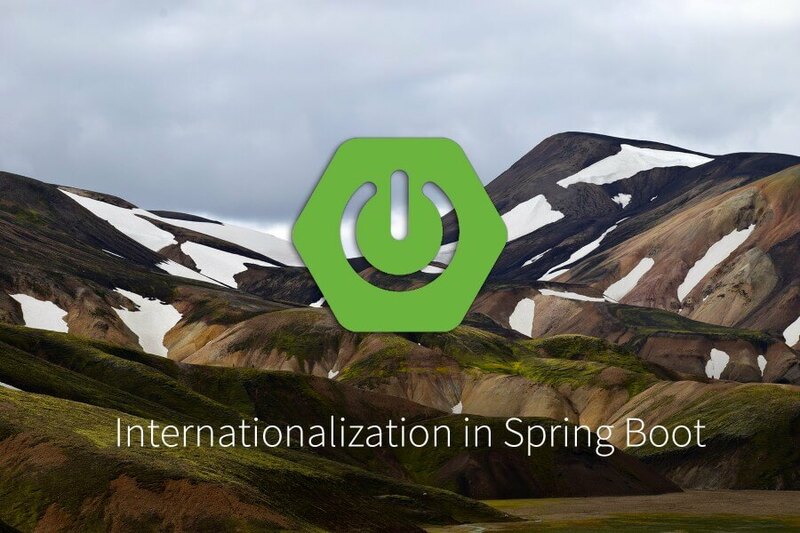 Java internalization classes and methods for each locale makes internationalizing software feasible. The first step in planning to internationalize an application is identifying culturally dependent data. Java has many classes for translating and handling internationalization to minimize the amount of new code that needs to be written to handle each item. The most important of these tasks is to specify the locales required with the use of resource bundles. Figure 2. Initial Steps to Consider When Planning the Internationalization Process During Software Development. The first step in internationalization is isolating text that can be translated into ResourceBundle objects. The text includes GUI labels, status and error messages, and help files. Applications that are not internationalized have text hard-coded into the code. For additional information on ResourceBundle objects, go to the section on Isolating Locale-Specific Data for details. Compound messages have constituents that need to be translated into locale-specific code, and cannot be handled by resource bundles alone. Compound messages often have a combination of words and numbers that need to be translated. Additional information can be found in the Messages section of this tutorial. Numbers and currencies may need to be displayed in a specific manner, depending upon the locale. These classes are discussed in greater detail in the Numbers and Currencies section. The format of dates and times differ with region and language. 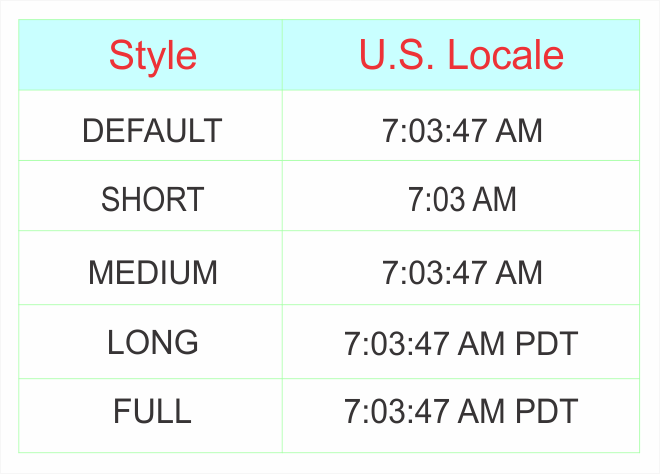 Using Java’s date-formatting classes will enable you to display dates and times correctly around the world. For additional information, see the section Dates and Times. When comparing characters in languages other than English, the Unicode standard should be used to identify character properties. For information on character comparison methods, see the section on Checking Character Properties. When sorting text, it is normal to compare strings. The standard string comparison classes, String.equals and String.compareTo methods perform binary comparisons, which are not effective in many languages. The Collator class should be used to compare strings in foreign locales. For additional information, review the section on Comparing Strings. Characters in the Java programming language are encoded in Unicode. If your application handles non-Unicode text, you might need to translate it into Unicode. 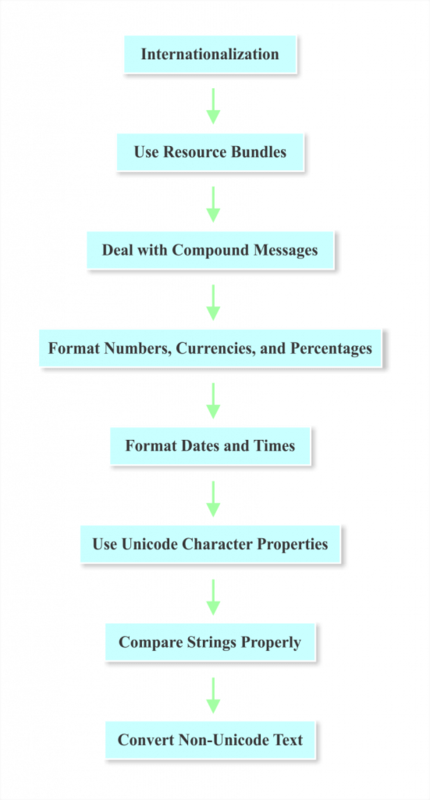 For additional information, review the section on Converting Non-Unicode Text. An internationalized program displays information differently for different users in other regions across the world. For example, an internalized program will display a message in American English for someone in the US and a message in British English to someone in the United Kingdom. The internationalized program uses a Locale object to identify the appropriate region of the end user. The locale-sensitive operations use the Locale class found in the java.util package. Figure 3. Four Common Methods for Creating a Locale. The next few sections will show different methods for creating the Locale object and the differences between them. Locale(String language): Creates a locale from a language code. Locale(String language, String country): Creates a locale from a language and then the country code. Locale(String language, String country, String variant): Creates a locale from language, country, and variant. 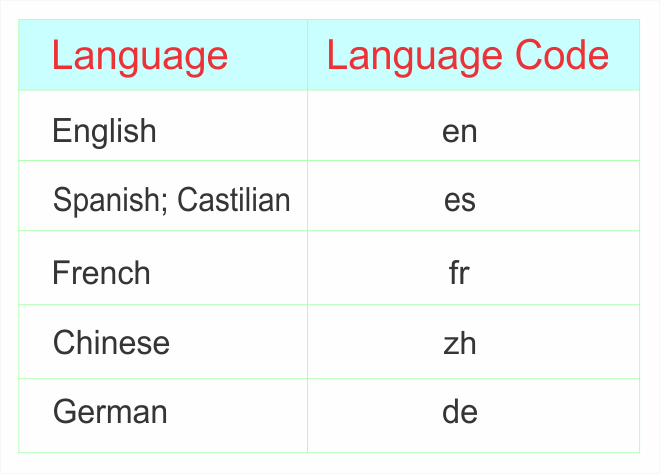 The Locale class provides a set of pre-defined constants for some languages and countries. If a language is specified, the regional part of the local is unspecified. 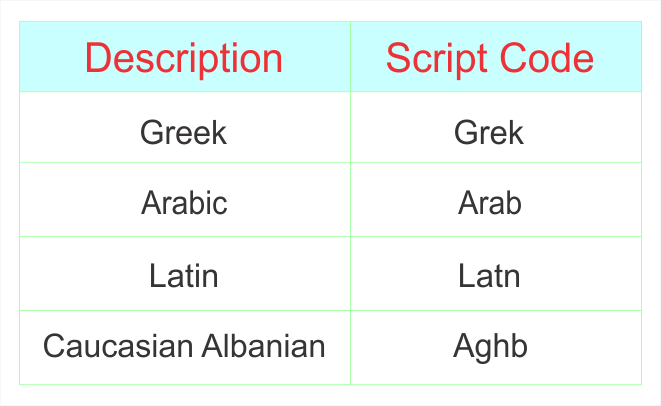 There are language, country, region, script, and variant codes. The next few sections describe each type of code and provide code examples. The language code consists of two or three lowercase letters that conform to the ISO-639 standard. 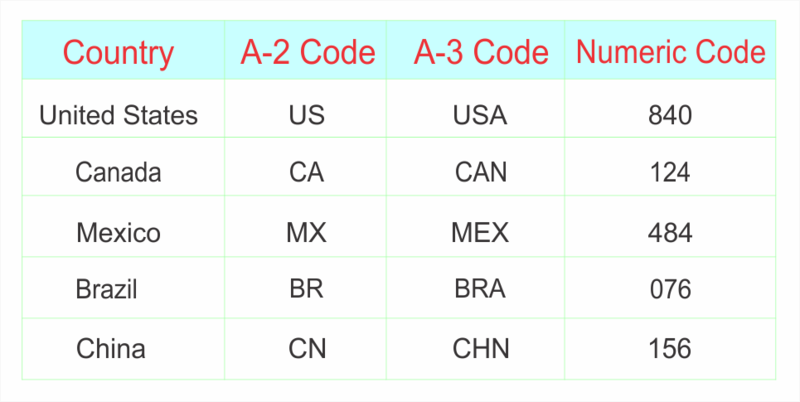 A few of the ISO-639 language codes are shown in Table 1. The complete list of ISO-639 language codes is available online. The country (region) code conforms to the ISO 3166 standard or three numbers that conform to the UN M.49 standard. The list of ISO 3166 language codes is available online. The script code conforms to the ISO 15924 standard and begins with an uppercase letter followed by three lowercase letters. The list of full list of language codes can be found in the IANA Language Subtag Registry. Variants are used to specify a certain part of a locale. It can further define dialects or language variations that further define a specific region. The variant can tailor output for a specific browser or operating system. The variant part describes a variant (dialect) of a language following the BCP 47 standard. getDefault() provides the default Locale object. getAvailableLocales() provides an array of available locales. getISO3Country() provides the three letter abbreviation for the current locale’s country. getISO3Language() provides the three letter abbreviation for the current locale’s language. • Allow storage and retrieval of all locale-specific information. • Allow support for multiple locales in a single application. • Allow the addition of locales easily by adding additional resource bundles. The java.util.ResourceBundle class stores text that are locale sensitive. 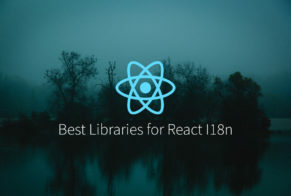 This section reviews the ResourceBundle class and its subclasses. Figure 4. Illustration of ResourceBundles Communicate with Applications. ResourceBundle acts like a container that holds key/value pairs. The key identifies a specific value in a bundle. A subclass of resource bundle implements two abstract methods: getKeys and handleGetObject. The handleGetObject(String key) uses a string as its argument, and then it returns a specific value from the resource bundle. The getKeys method returns all keys from a specific resource bundle. The default Locale would be named “newResourceBundle”. All of the files will be located in the same package or directory. All of the property files with a different language, country, and variant codes will contain the same keys but have values in different languages. The comment lines in a properties files have a (#) pound or (!) exclamation at the beginning of the line. A set of all keys in a ResourceBundle can be obtained using the keySet() method. The format for displaying date and time varies depending on the locale. For example, 07/03/1977 can be interpreted as July 3, 1977, in the U.S., but would be interpreted as March 7, 1977, in Britain. The order of the fields, delimiters used and even the calendar used can vary depending on the region. The DateFormat class in java.util package provides formatting styles for a specific locale in easy-to-use formats. Table 4. 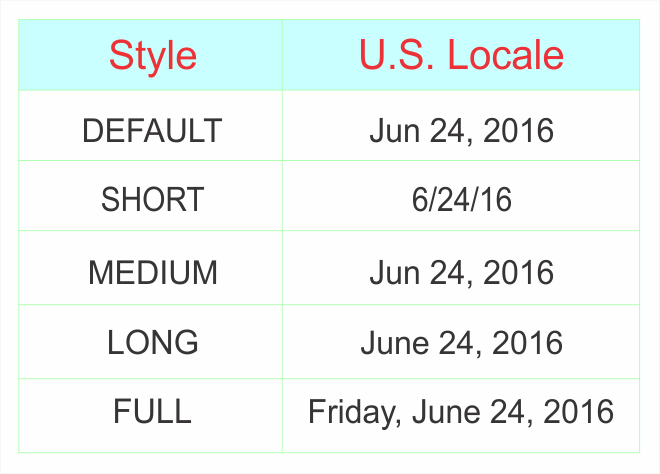 Styles for U.S. Locale. The getDateTimeInstance method can be used to format both date and time. The inputs for the getDateTimeInstance method consist of (1) the date format to use, (2) the time format to use, and the (3) locale. The input for the getNumberInstance method consists of the locale. Create the calendar instance using the calendar subclass. The GregorianCalendar is typically used. Use the TimeZone class to get the timezone. Set the time in the desired timezone. Set the time to the desired target time zone. Messages help the user to understand the status of a program. Messages keep the user informed, and also display any errors that are occurring. Local applications need to display messages in the appropriate language to be understood by a user in a specific locale. As described previously, strings are usually moved into a ResourceBundle to be translated appropriately. However, if there is data embedded in a message that is variable, there are some extra steps to prepare it for translation. A compound message contains data that has numbers or text that are local-specific. The input parameter for each of these methods is a char. For example, if char newChar = ‘A’, then Character.isDigit (newChar) = False and Character.isLetter(newChar) = true. The Character class also has a getType() method. The getType method returns the type of a specified character. For example, the getType method will return Character.UPPERCASE_LETTER for the character “A”. The Character API documentation fully specifies the methods in the Character class. The return value would result in a “-1”. 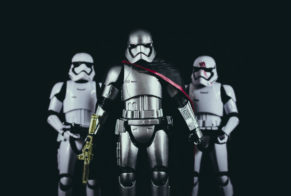 The string “ab” will appear before the string “yz” when sorted according to the US rules. Define the rules that will be used to compare characters in a string object. The example defines that x comes before y, and y comes before z. The results will print out a “1” because x comes before z. Many applications need to find where text boundaries begin and end. In different languages, character, word, and sentence boundaries may abide by different rules. One method of handling this is to search for punctuation such as periods, commas, spaces, or colons. The java.text.BreakIterator class makes it easier to search for boundaries in different languages. The BreakIterator class holds an imaginary cursor to a current boundary in a string of text, and the cursor can be moved with the previous and next methods. The first boundary will be “0”, and the last boundary will be the length of the string. Figure 6. The boundaries found using the BreakIterator class. Finding the location of character boundaries may be important if the end user can highlight one character at a time. Depending upon the language used, a character may depend on upon more than one Unicode character. The getCharacterInstance method in the BreakIterator class finds character boundaries for user characters, not Unicode characters. Figure 7. The boundaries found using the first() and next() methods. Unicode characters should be used in internationalization of all software, operating systems, and the world wide web. The Java programming language stores all characters in UTF-16. Since not all text received from users default file encoding, your application may need to convert into Unicode. Outgoing text may also need to be converted from Unicode to the format required by the outside file. Figure 8. Illustration of InputStreamReader and OutputStreamWriter. You would like this program to display the same messages for users in Germany and France. Since you do not know German and French, you will need to hire a translator, and since the translator will not be used to looking at the code, and the text that needs to be translated needs to be moved into a separate file. Also, you are interested in translating this program into other languages in the future. The best method of efficiently translating these messages is to internationalize the program. The program after internationalization looks like the following example. The messages are not hardcoded into the program. The values on the left sign of the equal sign are called “keys”, and these remain the same in every properties file. These are the references that the globalized program uses to call the values in a particular language. Specifying a local only identifies a region and language. For other functions, additional code must be written to format dates, numbers, currencies, time zones, etc. These objects are locale-sensitive because their behavior varies according to Locale. 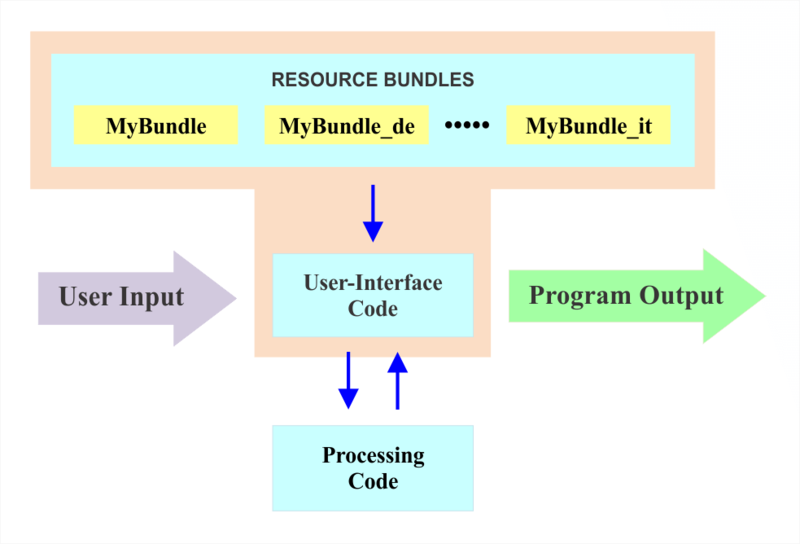 A ResourceBundle is an example of a locale-sensitive object. The locale will specify which MessagesBundle files is chosen using the language and country code, which follows the MessagesBundle in the names of the properties files. The next step is to obtain the translated messages from the ResourceBundle. As you can see, the basic steps of internationalizing a program are simple. 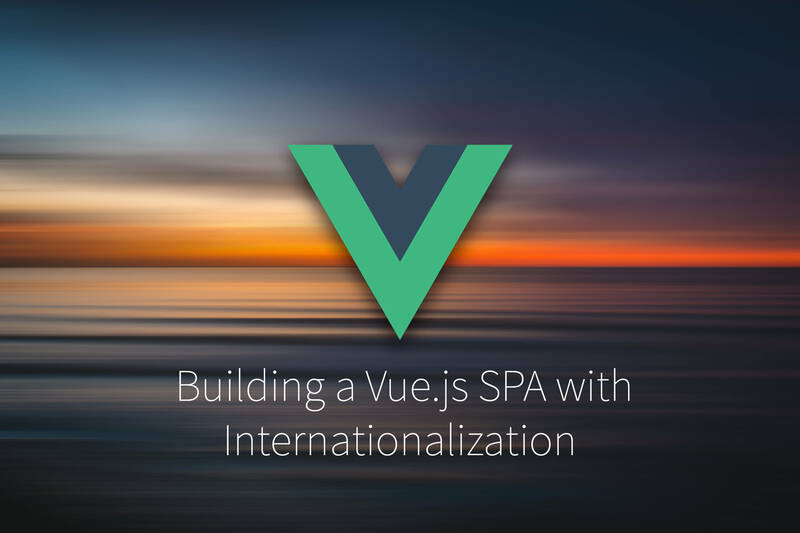 It requires some planning and some extra coding, but the process of internationalization can save a lot of time if the program needs to be used in multiple locales. The topics and examples in this tutorial provide a starting point for some of the other internationalization features of the Java programming language. Published on September 19th, 2016 by Oliver. Last updated at March 28th, 2019 .